Brahim El Boudani gained his qualifications in Morocco before starting a career in the IT industry in the UK. When two graduates from London South Bank University (LSBU) joined his company, Brahim was captivated by the enthusiasm they showed for their studies and was impressed by the business knowledge they demonstrated early in their careers. "In August I honestly thought it would be too late to apply, but I phoned LSBU and the person I spoke to encouraged me to put in an application through the Clearing service. I was near-certain that I would not be accepted, as I was applying late and there were many other applicants, but I was reassured by staff that my application would be considered fairly. "Going through the Clearing process was simple and easy, and when I was offered a place I was very excited. I was, however, slightly concerned about having to make up a lot of ground, as I would be enrolling a little later than other students on the course and didn't want to fall behind. I needn't have been concerned; I met regularly with the course director who arranged some extra support in study skills for me, and recommended some additional mathematics tuition, as I had not studied this for a number of years." The great thing about the LSBU course is that you can choose your own pathway through it. 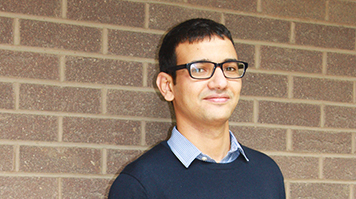 For Brahim, the modular nature of the LSBU Business Intelligence course was one of the key reasons behind his application. "There is always a chance for you to change how you want to study, designing your own course to follow your interests. By identifying your interests early on, I think it's more likely that you will find the job you want at the end of studies." Brahim is keen to encourage others considering their career to seize the opportunities provided by Clearing to shape their future direction. "It's never too late to apply, never too late to give it a go, and at LSBU you will find friendly staff, all of whom want to help you. My advice is to never give up and to stop hesitating – if I didn't make that one phone call I wouldn't be here today!"